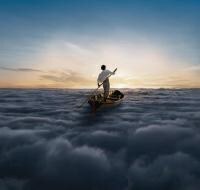 On The Endless River, Pink Floyd sounds as strong as it did during some of its best years. On this almost entirely instrumental album, however, the lyrics are sorely missed. David Gilmour’s 2006 solo album On an Island was promoted with the slogan, “The Voice and Guitar of Pink Floyd”. While Gilmour was one of a few singers for Pink Floyd over the years, his is arguably the most recognizable and commonly heard Pink Floyd vocalist; he edges out Roger Waters’ own brilliant wail by a small margin. He is also, of course, a guitar virtuoso whose Stratocaster-powered licks helped shape the Floyd’s signature sound album after album. But Pink Floyd’s brilliance has almost always been (loudly) amplified by the amazing balance of words and music, with the band’s powerful lyrics being the only real match for their epic rock and roll sounds. These facts make Pink Floyd’s 2014 release, its 15th and reportedly final album The Endless River, something of a strange anomaly in that virtually every single track is completely wordless. To be sure, instrumental work is far from a unique or new road to travel for Pink Floyd. The band’s third album, 1969’s More -- their first album completely free of founder Syd Barrett -- featured a number of purely instrumental tracks and the band continued to place instrumental tracks on virtually every release since that time. This method was used to great impact in several parts of the epic “Shine on You Crazy Diamond”, a tribute to Barrett -- as was the entire Wish You Were Here (1975) album. The Endless River does not simply eschew lyrics for certain movements of songs. The Endless River’s lyrical dearth expands across almost the entirety of this double-length album. While it is true that many of the songs here do feature Gilmour’s amazing guitar work (technically they all do, but the virtuoso solos are not found in every track), only one single song features “the voice” of Pink Floyd. That song is the appropriately titled “Louder than Words”, with lyrics written by Gilmour’s wife Polly Samson. All the other of the remarkably few voices consist of brief samples, some wordless backing vocals, and a recorded monologue by Stephen Hawking. While something is most assuredly “missing” from a Pink Floyd album with (almost) no words, one key factor here is that The Endless River sounds like Pink Floyd. Gilmour’s guitar is unmistakable. The bass lines, although not played by Waters, evoke memories of some of the best bass riffs the Floyd has employed over the decades. The drumming is vintage Nick Mason. The keyboards are unmistakably Richard Wright -- more on this in a moment. By no means is this merely a retrospective of the Floyd sound. If this were the case, this album would be another example of what Roger Waters said when describing the Pink Floyd albums released after his departure: “a quite clever forgery”. Much can be said for what is the "real" Pink Floyd; many will argue that the band simply isn’t Pink Floyd without Roger Waters; but, then again, the band soldiered on without him much as they soldiered on without founder Syd Barrett. The debate over "What’s in a name?" will continue to rage. While the Gilmour-led Pink Floyd has created enough amazing work to prove it is not merely a Pink Floyd cover band, there are a number of nods to the classics. “Side 1, Pt. 2: It’s What We Do” evokes memories of Wish You Were Here’s “Welcome to the Machine”. “Side 2, Pt. 1: Sum” plays like a lighter version of Meddle’s “One of These Days”. However, there are some more unique sounds to play with here as well. “Side 2, Pt. 2: Skins” is a New Age-infused, multi-instrumental experiment in that brilliant (if you will pardon the pun) Wall of sound that we expect from Pink Floyd. “Side 2, Pt. 4: Anisina” features a loud and excellent David Gilmour guitar solo. “Side 3, Pt. 6: Allons-Y (2)” is undeniably Pink Floyd, but with a much heavier infusion of the jazz sound it often have experimented with. Much of the album does sound like the two previously released Gilmour-led Floyd studio albums. There are many echoes of Momentary Lapse of Reason (1987), but the similarities are exceptionally clear when The Endless River is compared to the band’s most recent album, the now 20 year old The Division Bell (1994). This is, of course, no accident. While this is the third post-Waters Pink Floyd album, this is also the first Pink Floyd album to be released after the death of keyboardist Richard Wright (1943 - 2008). However, Wright’s keys, and literally fingerprints, are written all over this album. Wright’s performance is not simply culled from archival footage; almost the entire album was actually culled from archival footage. The Endless River is the product of 20 hours of unreleased recordings from the sessions for The Division Bell, recently completed and produced for public consumption with a few overlays and additional work here and there. As much as one might love to think of Stephen Hawking hanging out with his favorite space rock band in the studio given the physicist's presence on the album, this apparently never happened. The Division Bell’s lead single “Keep Talking” prominently featured the electronic voice of Hawking; however, this wasn’t exactly a musical collaboration as Hawking’s words were originally recorded for a British Telecommunications television commercial. The Endless River’s “Side 3, Pt. 7: Talkin' Hawkin'“ follows this move, and is thus not really a new exploration of the Floyd/Hawking experiment. While Hawking is talking over much of this song, these words are an expansion of the same TV ad monologue that “Keep Talking” borrowed from. And what of the sole “song” on the entire sprawling album, “Side 4, Pt. 4: Louder Than Words?" The song is a pretty good light rock track concerning a relationship’s problems resolving without words. Much of The Endless River seems to follow the philosophy featured in “Louder Than Words” as it attempts to fix its issues with almost no words whatsoever, tapping away at the sum of its parts with loud, trippy song textures, but without the depth that Floyd’s lyrics always added. This is, of course, the biggest contribution to the flaws in The Endless River, an album that might better have been entitled Louder Than Words, as telling as that title is. The best Pink Floyd songs have had lyrics that were strange and other-worldly, filled with metaphor and strange references. Some of the most haunting lyrics, such as those found in parts of “Sheep” from 1977’s Animals, are not even discernible without a lyrics sheet. It wasn’t until Waters began to spell everything out clearly on 1983’s The Final Cut that Pink Floyd stopped truly sounding like Pink Floyd. In short, the lyrics do not even really need to make sense to be both Floydian -- and epically Pink -- but they should certainly be there. The Deluxe Edition of The Endless River continues with some surprisingly great music, especially the hard rock track “Nervana” that both sounds like Pink Floyd and shows a daring direction that they could have (and perhaps should have) ventured into. This is a uniquely catchy guitar based jam track that could only have been better with words added. Had Pink Floyd set expectations differently, this might have been a bigger success. They could have released The Endless River as a rarities collection of “unfinished” songs from the Division Bell sessions and fans would have eaten the record up, marveling at what their favorite band considered to be “unfinished”. Instead, this album was released as something of a swan song, both for Richard Wright and for the band itself, and thus fans (and critics) were set to expect a truly full and rich Pink Floyd album. Had the band entered the studio, penned some lyrics, and left many of the sprawling long instrumentals both long and instrumental, but dared to enhance the already existing quality music with new lyrics, the album could have gone from good, or even very good to excellent, or very nearly perfect. As it stands, The Endless River is still worthy of praise, as it doesn’t really have any truly bad moments throughout its long run time. This is an enticing and haunting musical experience with layered textures and enchanting combinations of varied rhythms and melodies. The problems with The Endless River are not so much what we are given, but what is left out. Without the vocals, something is very clearly missing and the listener is left wanting more. While this makes for a good album, The Endless River is not quite fitting to serve as the final album of the greatest rock band of their kind, to say nothing of one of the greatest rock bands of any kind ever to perform.